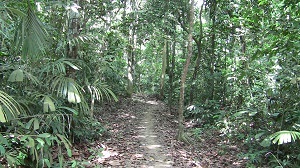 Hiking Trail at “Taman Hutan Kota” (City Jungle Park). The City of Jambi has set aside a section of land for camping, hiking, and general leisure. It is a very nice park with well maintained hiking trails. It’s not a large park, and can be walked around in the space of an hour. This park is only 1-2 miles from Taman Hutan Kenali. It is difficult to find, however, since the roads are not marked. To help those trying to find the park, its location can be found by clicking this link.